Been so busy studying for the exams – we have our mocks in 2 weeks and then the real JAA exams the week after! That’s why this space has been pretty quiet lately. We’ve finished the syllabus in most of our subjects quite early, leaving us more time to revise and study. Other than studying, we went out for a short field-trip a couple of weeks ago for Engines (Power Plants) class. Our class went along to the hangers to prod and touch a Piper Seneca. 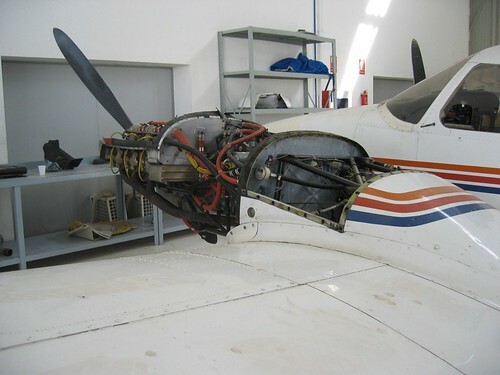 It’s far easier to be shown how an engine works when it’s there in front of you! 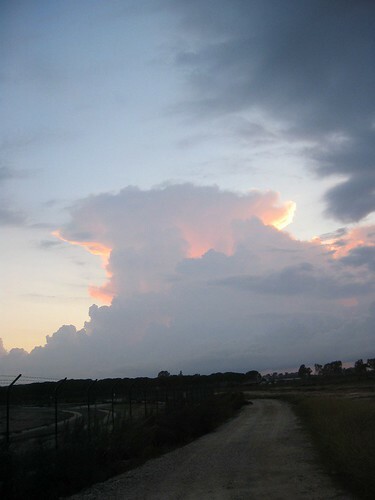 Here a photo of the sky I took a couple of weeks ago when we trekked over to the threshold of the runway. From my Meteorology class I know that we’re looking at a towering cumulus that’s developing into a CB (cumulonimbus) which gave us thunderstorm less than an hour later that day! Earlier on today we went onto the apron to take a few class photos – will post them up when I get them. We also strolled over to a parked Air Greenland B757-20o and took a few photos next to it, in various poses! I also took the opportunity to take Nikki out for her first public outing (my new Nikon D80) – took quite a few photos and those will be posted up later as well. I’ve been wanting a Nikon D80 for months now, so I’m glad that I finally own one! It will take some time to figure out how everything works, but I’m up for the challenge and I’m already enjoying the extra room this camera has given me. No doubt I’ll be out on the weekend during study-breaks taking a few more photos of aircraft! Night Flying: lights, lasers and black holes.